1746 Well, that's it for our commentary on the pre-Budget report. Thanks for all your comments by email and Twitter. We'll be back next Wednesday for prime minister's questions - hope you can join us then. BBC deputy political editor James Landale writes: Today was a chance for Alistair Darling to change the political weather. In fact, I am not sure what politically the pre-Budget report has changed. The government remains committed to cutting the deficit in half over four years; all we have learned today is a little more detail of how it might do it. And even that was quite modest - most of the tax rises announced today will pay for protecting spending, not paying down the deficit. 1734 While fears of widespread cuts in the UK are looming, the Republic of Ireland has been told of a swingeing package in its budget, revealed today. The government is looking to save 4bn euros, with cuts across the board. Jack O'Connor, president of the Irish Congress of Trade Unions, says it "must rank as the most callous, unjust and uncaring budget introduced by any minister for finance since the 1930s in this country". The government argues that the changes are necessary to reduce the deficit. New Labour know they are going to lose the next election so their promises are most unlikely to be called in. What they are doing now is to plant bombs ready to explode under the Tories when they take over. Pure politics and of no use whatsoever to the economy or the country. 1726 Dave Prentis, general secretary of the public sector union Unison, tells BBC Radio 4's PM that members are worried about their families' long-term future and that the pre-Budget report has added to their concerns. Does anyone realise that banks don't have to be based in London? They could relocate to anywhere in Europe within one year, which would mean no tax revenue at all for the UK, not to mention the knock-on effect to other jobs and business in London. House prices would also suffer immensely if we had this exodus. Commentators missing the point on bingo duty reduction, as it went up last year from 15% to 22% (almost a 50% rise) so reduction to 20% is too little! A speech that lacked sense and driven straight at the voting electorate - exactly how we got into this situation in the first place. Against Alistair Darling and the formidable Vince Cable, the shadow chancellor really does come off badly. He and his party had nothing at all to offer in their response despite months of goading Labour. A poor performance if ever I saw one, Mr Osborne. 1719 It's grey, thick-skinned and has been keeping a low profile for several days. No, not the chancellor. 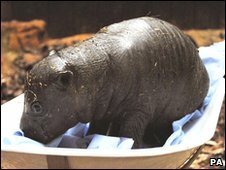 A baby pigmy hippo, born at Colchester Zoo on 27 November, has made her public debut. A zoo spokeswoman says: "Mixing pygmy hippos is always a very precarious matter, as they can be remarkably territorial and aggressive animals." A bit like politicians on pre-Budget report day, one might say. Name suggestions for the hippo? Prudence? 1656 SNP MP Stuart McMillan says he is "appalled" at the pre-Budget report, which he says would slash £500m from Scotland's annual budget and could put a major dent in its economic future. For Plaid Cymru, meanwhile, MP Elfyn Llwyd claims the evidence is clear that it is a "highly political statement". All the good things, like the 2.5% pension rise, will come in April, pre-election, and all the pain will follow from 2011 onwards, he adds. Tax on bankers is one thing, but working in a sales environment for a high street lender with a low basic wage and good prospects of OTE [over target earnings] is going to have a significant bearing on my low income family. Not all people who work for banks are at fault. Will the boiler scrappage scheme apply to landlords? Would seem pointless to exclude rental properties. How can we talk about a 1% pay cap for the public sector when it is being funded by borrowing? My children are going to have to repay in years to come. The public sector should consider themselves lucky that measures similar to those proposed in Ireland are not on the table. I have not had a pay rise for four years. I am a stockbroker. No, not a banker - no guaranteed bonus, no bail out money, not a bank. My profitable firm has paid tax on profits, as have employees on bonuses, which are the means of remuneration. According to the documents, we are caught up in this PR tax. Can someone tell me why? I would have liked to see a substantial cut in corporation tax for manufacturing industries employing in excess of, say, 500 people. We need to sell the UK as the place to locate large manufacturing facilities, rebalance the economy and reverse the tide of manufacturing leaving these shores. So how long will US banks want to keep offices in London if their UK staff have their bonuses halved whilst their US and Asia colleagues do not? We didn't take any handouts from the UK Treasury (and have indeed paid back the US govt every cent), yet now we have to hand over 50% of our bonus pool? Don't lump us all in with the RBS and HBOS 'bankers' of this world. 1623 Well they've been mulling it over for a few hours, but a senior Tory source has now told the BBC's Carole Walker that they will NOT oppose the bankers' bonus tax, even though they do have serious concerns about how easy it could be for institutions to get round it. In contrast, the source said the National Insurance hike was the one measure a Cameron government would do its very best to avoid. I earn about £24k and I can assure you that I do not consider myself rich. After paying the ever increasing bills coming into my house, the rent petrol to get to work, food and helping support a partner who earns very little I am not left with a great deal. I do not live beyond my means and I do not have a luxury life. I am even scrimping to attempt to save a deposit for a house. Oh well, another blow to stop me getting on the property ladder! It's good that money is being transferred to help the unemployed; these are the people that really feel the impact of the recession. It is important that resources go directly to the user, not large organisation that ticks the right boxes. It is very frustrating to hear that once again the public sector will take a hit, I'm a public sector worker and I still have to pay bills and a mortgage. Congratulations, Mr Darling. I regularly work 100 hours a week to double my salary through 'bonus' which is effectively deferred salary. This has just been cut by one third - so much for enterprise and hard work. I'm out of here. What's the point of hard work if a govt is prepared to just take it away? Disgusted at the 1% cap on NHS workers - I am only a lowly part-time clerical worker, but support family of five since husband lost job in Woolies. To be told of an NI increase on top of that is a real kick in the teeth - I'd be better off on the dole. I suspect we are going to see some amazing avoidance tactics from within the banking industry. When does a 'commission payment' become a 'bonus'? or when does a 'banker' become a 'consultant' or 'sales person'? This is just electioneering gimmickry and will not address the real issue of getting the economy back into shape. darrenfelton tweets: Surely that was a pre-election report? BBC deputy political editor James Landale writes: Just a small wrinkle from the PBR. In a footnote, it says that the Foreign Office will have to cut its perks for overseas diplomats by £13m. So from now on our representatives abroad will have to travel economy class on flights under five hours, they won't be able to claim so much for their children's private education and their whole allowances system is being reformed. I can hear much gnashing of teeth in embassies across the world. 1541 Angela Knight, from the British Bankers' Association, said the UK had been much tougher on the financial sector than other countries and some foreign businesses could be tempted to flee as a result. "The real concern I have is how this is all looking to they many, many overseas companies who operate in the UK," she told the BBC. "All they are seeing is a constant argument about tax and constant changes to regulation. We need to give them some stability." 1539 A bit more detail on the household boiler scrappage scheme from Mick Williams, of the Reheat Britain campaign. He said it would allow 125,000 homes to get £400 back for their old boiler, saving the average three-bedroom homeowner about £250 a year. Some 60% of boilers used in Britain are made here too, so the scheme will boost manufacturing too, Mr Williams added. BBC deputy political editor James Landale writes: Around ten million people will be hit by the planned rise in national insurance tax according to the Treasury. Officials said that around 15 million people who earn less than £20,000 will not be affected by the 1% increase from April 2011. But the ten million earning more than that will be hit, raising £3.5bn for Treasury coffers by 2012/13. According to Treasury estimates, anyone earning £30,000 will be £90 worse off. Anyone on £40,000 will be £190 worse off. The same figures for those earning more are as follows: £50,000 - £20 worse off; £75,000 - £250 worse off; £100,000 - £520 worse off; £120,000 - £720 worse off; £150,000 - £1,020 worse off; and £200,000 - £1,520 worse off. Correspondingly, anyone earning just £10,000 will be £110 better off. The spokesman was asked why, if raising national insurance was so important, it had been delayed until April 2011. He replied that that was when the Government needed money to pay for protecting health and schools budgets. What he really wanted to say but couldn't because he is a civil servant, is that there is going to be a general election next year. 1513 Shadow chief secretary to the Treasury Philip Hammond said his party had worked out that Mr Darling's measures would leave the average family £370 worse off over two years. He said the government had made it clear its definition of "rich" - anyone earning over £20,000 a year, the threshold for the planned National Insurance increase. 1455 Removing the fiscal stimulus now would be like trying to put a car into fourth gear at 10mph. That's the feeling of former home secretary John Reid. Doing so would see the car - and the economy - stall. So, to stretch the metaphor as far as it will go, don't let the Tories get behind the wheel if you ever want to get to your destination - the sunny climes of fiscal recovery, he says. BBC deputy political editor James Landale writes: The Treasury has given more details of how much the budgets for schools, health and police will be protected. A spokesman said that 95% of the NHS budget would remain "constant in real terms". They estimate this would mean the health budget would rise by £3.7bn in 2012/13. Schooling for three to 16-year-olds would see a 0.7% real terms increase; schooling for 16 to 19-year-olds would see a 0.9% real terms increase; the Sure Start budget would be held constant in real terms. The Treasury estimates this ring-fencing would cost £2.6bn a year by 2012/13. The spokesman said the cost of protecting the schools, health and police budgets would be covered by the government efficiency measures, public sector pay and pension caps and tax rises announced in the PBR. He was less clear about any implications for other non-protected departmental budgets. The key point about this ring-fencing is that it is simply an estimate by the Treasury of the level of spending needed to maintain services as they are. In other words, it is a best guess, not a firm set of figures. They will come later in a future spending review, which the government is refusing to carry out anytime soon. 1443 The big rush is over now, with figures at Westminster, in the City and elsewhere digesting the details of Mr Darling's report. We'll stop the automatically refreshing text now but will continue to update this page with more analysis and reaction as we get it during the course of the afternoon. 1441 If reaction coming to us is anything to go by, the government will have a fight on its hands - if it is still in power, of course - to introduce a public sector pay cap. Brendan Barber, from the TUC, says it is "unfair and inefficient". Finally, a tax policy I can agree on. I worked with bankers and traders for a year and they do very little for their money. Most of their time is spent at a local pub or restaurant. Where they drink copious amounts of alcohol. Upon arriving bank at work they do a couple of hours of high-adrenaline trades that basically involves nothing as computer software tells them when to make the trade, and then they get paid loads for relatively little. Furthermore, they singlehandedly messed up the economy, for which I can say 'Well done chaps. Now its your turn to pay.' Negligence has its repercussions. Lowest standard rate of VAT allowed in the EU is 15%, the reduced rates of 5% are only available on a subsection of goods and supplies that governments can choose - but no EU government can have everything at 5%. We already have items at 5%, so putting that rate across the board isn't an option. 1438 Finally, someone on the side of the bankers. But don't get excited - he is a banker himself. David Buik, senior partner at City firm BGC, says the tax on bonuses is "nasty, pernicious and vituperative". wallaceme tweets: It's appalling that Darling talked about helping the unemployed, then hiked National Insurance, which is a tax on jobs. David in Norfolk - tax legislation refers to money or money's worth so anything with a monetary value is taxed as if it is cash. That loophole was closed long ago. And bonuses are taxed when they are due (when the person becomes entitled to them, as per the plan rules), not when they are paid. 1425 Breaking fashion news. Mr Darling's swirly patterned, charcoal grey tie was chosen by his wife Maggie, the BBC's Claire Williams reports. It is also a "Fairtrade" garment, she adds. 1422 Robert Chote, director the Institute for Fiscal Studies, says there's a "weird profile" in the policy plans - spending more money in the next year to 18 months, followed by a squeeze after that. That squeeze will be "very tough indeed" for those within public services but away from the so-called "front line", he feels. Watch out, civil servants, in other words. What happens if the banks decide to defer the payment until next year or make the payment using another "currency" such as fine wine or pictures? The lowest EU rate of VAT is not 15%. In France eating out VAT has been reduced to 5.5% (except on alcohol). Why can't we do that too? 1416 The National Insurance increase seems to be provoking the greatest reaction so far. The CBI thinks it is "a serious mistake" to tax job creation in this way. Director general Richard Lambert also says the focus on bankers' bonuses has "populist appeal", but fears it could put the UK at "a competitive disadvantage internationally". This is madness. It's not just re-arranging the deck chairs on the Titanic; it's offering bribes to sit on them! We need major across-the-board cuts in public expenditure now, along with modest tax increases. Failure to do this will doom us to many years of stagflation and a worthless pound. Good to see that everyone's main concern in this recession, bingo, has been handled by the government. 1411 BBC economics editor Stephanie Flanders says the government is trying to persuade people it can pull off "a wonderful balancing act" - carrying on spending, yet also saving. She says it sounds like the government is doing exactly what it has criticised the Tories for planning to do - removing the fiscal stimulus, in the form of the VAT cut, before recovery is guaranteed. 1404 Chief Secretary to the Treasury Liam Byrne is asked by the BBC's Andrew Neil why the government is increasing National Insurance - making it more expensive to employ people - precisely at a time when more of the country is out of work. Mr Byrne says that, by the time the rise is brought in, the economy will be growing well and able to cope. He also says NI has been singled out for a rise rather than income tax because it is the fairer choice. The VAT rate should be cut to 5%, Mr Darling. To increase it again is punitive and will damage the wider economy. A rate cut to 5% across the board will encourage spending and cut transport costs, reducing overheads on goods in the shops and increasing profits (which you can tax). 1400 Former Lib Dem leader Charles Kennedy says the pre-Budget report is "a political exercise" which merely puts off the really difficult choices. And despite all the use of the word fair, Mr Kennedy thinks the chancellor's plans are decidedly unfair and will still leave low and middle-income families paying a disproportionate amount of tax. I really wish Vince Cable was a Tory. The Lib Dems don't deserve him. That would really put the skids under Labour. BBC political correspondent Reeta Chakrabarti writes: Vince Cable's ending mantra is all about fairness - no surprise there, since the Lib Dems' own tax and spend plans are, they say, driven by fairness. He's asked awkward questions about the chancellor's headline grabber, a tax on bankers' bonuses. How would it be enforced, and how will Mr Darling stop banks from rolling bonuses into salaries? A question many have posed today. 1349 In the City, David Frost, from the British Chambers of Commerce, tells the BBC he is fairly pleased with some of the "micro-measures", such as those on corporation tax. But he says the additional National Insurance hike is "terrible" news, a major new cost for businesses when they can least afford it. 1348 First reaction from the unions - and it's not a happy one. Dave Prentis, from Unison, says he will not accept the proposed 1% on public sector pay deals. "It is just not on to make nurses, social workers, dinner ladies and hospital porters pay the price for the folly of the bankers," he says. 1341 Mr Cable argues that the increase in taxation will all be spent and not used to pay down the deficit, calling it a "complete distortion". 1339 Lib Dem Treasury spokesman Vince Cable is on his feet, with a customary gag. He says the pre-Budget report is "good for bingo and boilers". But he gets more serious in attacking the arrogance of some bankers. 1137 Mr Darling is sticking to his script, saying there will be as little damage to people's future as possible. 1335 Mr Osborne compares the prime minster to one of the banks so hated by the public at present. Cap in hand, Mr Brown now wants a bail-out from the taxpayer, he adds. But, the shadow chancellor warns, most bail-outs start with a change at the top. Mixed metaphors but a direct message to Labour. BBC political correspondent Reeta Chakrabarti writes: Ouch, that probably hurt. That Osborne jibe at Labour no longer supporting aspiration - people who want to save for their retirement, or pass something on to their children - will have hit home with all those architects of the big New Labour tent. nickmward tweets: Best PBR ever? I think so! Preserving frontline services, investing in our future, protecting children and claiming back our money! 1330 Mr Osborne thinks Mr Darling has achieved the almost impossible - "ring-fencing a black hole" - by staying almost entirely silent on where cuts will be made but promising to keep on spending. BBC political correspondent Reeta Chakrabarti writes: George Osborne is almost enjoying throwing Alistair Darling's figures back in his face - on debt, deficit, borrowing, and missed forecasts. What he's not saying - because he's not required to - is what the Tories would have done in Mr Darling's position. The one thing we do know is he would start cutting spending now, not in 2011, but where or how much is unclear. andrew_paradigm tweets: Apparently Darling's making these decisions and announcements "from a position of strength." Is he serious?! 1325 Mr Osborne says the state of the economy is a "catastrophe". He accuses the chancellor of "sleight of hand" and "sneaky fiddling" in trying to conceal the true scale of the crisis. 1324 And that's it. Mr Darling sits down and the man who wants to replace him, George Osborne, stands up. The shadow chancellor launches his attack immediately. It was a pre-election report not a pre-Budget report, he says, adding that it proves that no-one should ever trust a Labour government with their money ever again. 1320 All employer, employee and self-employed rates of National Insurance will rise by a further 0.5% from April 2011, but those who earn £20,000 or less will be protected from the increase. 1317 Here come the cut, or "efficiency savings". The chancellor says there will be £5bn of savings from scaling back spending programmes, such as cutting back on major IT projects, reforming legal aid and outsourcing prison management. Tax banding is unfair to those that do well. Why don't we have one flat rate for all? BBC deputy political editor James Landale writes: The freeze in inheritance tax threshold at £325,000 is not quite what it seems. Yes, the government will not raise it to £350,000. But it will allow couples to pool the total to £650,000. For some couples - and more importantly their children - that is quite a tax cut. So Labour is not quite as opposed to cutting IHT as is sometimes likes to make out. 1313 Big shouts and ironic laughs as Mr Darling says he makes these decisions "from a position of strength". 1312 Mr Darling says over half of the additional revenue raised from bonuses and inheritances will be paid by the top 2% of earners. It's all about fairness he says, once again. BBC deputy political editor James Landale writes: Mr Darling says he wants taxes to be fair. The bankers will beg to differ. Note that the bonus tax is designed to change behaviour in the City and win votes in the country. Note too that Mr Darling has just introduced a rare precedent that the Treasury normally avoids: he has implied that the tax is hypothecated, namely that it is raised to pay for a specific piece of government spending. He said the £500m raised would go to pay for the programmes he has announced to help the young unemployed and support business. In truth, this is a tad disingenuous. The cash from the bonuses will just go straight into the Treasury pot as usual. 1309 Another much-anticipated announcement - the inheritance tax threshold will not be raised from £325,000 to £350,000 as planned. The chancellor says it is simply not a priority right now. 1307 Here it comes. Bankers' bonuses over £25,000 will be subject to a one-off 50% tax. The individual will not pay, their employer will - all bonuses over £25,000 will be pooled and then taxed en masse. Therefore, the chancellor says, banks can use their profits to build up their capital base, or, if they use it for bonuses, they will have to give a large sum back to the taxpayer. 1305 The chancellor says he will cut to 10p the corporation tax on profits from companies promoting research and development. 1304 A bit more for young people, many of whom who will of course be first-time and undecided voters. There will be financial support for 10,000 low-income undergraduates to help them carry out internships in professions and give their career prospects a boost. BBC deputy political editor James Landale writes: All pre-Budget reports must have a greenish tinge and this is no exception. The sums are quite small but the boiler scrappage scheme will raise a headline or two. And there are not that many people who generate enough electricity at home through wind turbines or solar power to benefit from a tax cut if they feed any power back into the national grid. 1259 The boiler scrappage scheme is confirmed, as well as an extra £200m from April to help 75,000 more homes improve their energy efficiency. There will also be tax breaks for people with their own wind turbines or electric cars. 1258 Despite the unfavourable reaction in the House, BBC economics editor Stephanie Flanders says it is impressive that the scale of borrowing has not increased much further given the turbulence of the economy. Darling is all talk and no trousers. What about a little humility after leading the country into the worst recession in 60 years under Gordon Brown's mantra of "no more boom & bust"? BBC deputy political editor James Landale writes: Mr Darling says he wants to cut the budget deficit in half over four years "in an orderly way". This is the nub of his argument. He says this "is a sensible timetable" that will not threaten recovery. In other words, the Tories would cut too quickly and too early. We are about to get some examples of how the government will cut some spending, but this will just be a little flesh on the bones of an existing policy. 1254 Mr Darling says his timetable for cutting the budget deficit by half over four years is "sensible", but admits that this year's borrowing will be higher than expected - £178bn rather than £175bn. It will also be £3bn higher in 2010/11 than previously forecast. 1251 As expected, the chancellor confirms that the UK economy will shrink by 4.75% this year, but predicts it will grow by between 1% and 1.5% during 2010. As he refers to "the strength of our economy" there are laughs from the opposition benches. 1249 Mr Darling confirms that the basic state pension will rise by 2.5% in 2010. But the BBC economics editor Stephanie Flanders points out that at the moment he is talking about spending money he knows he doesn't have, so the other side of the coin - the cutbacks and taxes - must be coming soon. 1246 We'd been expecting youth unemployment to come up and here it is - the education or training guarantee for 16 and 17-year-olds is to be extended for a further year. Anyone under 24 will also be guaranteed training or employment after six months out of work. BBC deputy political editor James Landale writes: Mr Darling is outlining lots of measures to support the economy - deferred tax rises for small businesses, help to avoid house repossessions. Even Treasury insiders accept that these plans are modest and do not involve large sums of money. 1244 "No government can prevent every job loss," Mr Darling says, but he insists that Labour's record is better than that of governments in many other countries. A short spell out of work is not turning into a lifetime on benefits - as under previous Tory administrations, he adds. 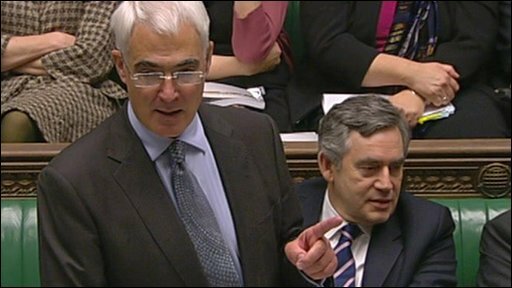 BBC deputy political editor James Landale writes: Alistair Darling's first theme is familiar stuff - Labour, he claims, has been right to stimulate the shrinking economy with expensive tax cuts and spending increases. What he makes less clear is that that stimulus is about to end; the money simply isn't there to do it. The political debate now is when to cut spending and by how much, not whether to keep stimulating. Note too that VAT will return to 17.5% in January - a regressive tax rise that hits the poorest hardest. 1241 Confirmation too that the 1p rise in corporation tax is being postponed. 1240 The chancellor confirms that VAT is going back up on 1 January to 17.5%, but says he has no other announcements on VAT. This may surprise some commentators who had suspected it could go up further in the not too distant future. 1239 Mr Darling says he is confident that growth will return this quarter, but recent problems in Dubai show just how fragile economies around the world still are. BBC deputy political editor James Landale writes: Never let is be said that Alistair Darling beats around the bush when it comes to politics. His opening remarks make it very clear that he intends this pre-Budget report to set out "two competing visions" for the future economy. In other words, vote Labour at the next election for economic growth, vote Tory to risk the recovery. 1236 Now Alistair Darling takes centre stage. He says the choice is between going for growth and trying to slash the deficit too quickly. It's a choice between two competing political plans - and two parties. Within the first couple of minutes, he uses that word "fair" again. 1235 Adam Holloway, Conservative gets a withering tone from the PM when he criticises Britain's response to the economic crisis. Mr Brown says his approach is the right one - a remark met with a shake of the head from David Cameron. 1232 Labour's Jeff Ennis is pleased about an American bed-spring company that has set up in his Barnsley constituency. Mr Brown says this is a good example of the sort of thing the chancellor is encouraging in order to get the country out of recession. PMQS has become a joke. Brown never answers a question and is allowed by yet another Speaker to get away with it. The rest of it is taken up by pre-loaded questions followed by a Labour Party political broadcast - a very well rehearsed one at that. Does this PM think we are all stupid? 1228 Labour's Derek Twigg asks about efforts to encourage renewable energy. The PM insists Britain will lead the way on cutting carbon emissions. He says wind power will be important, but plans have been turned down around the country by Tory councils. Finishing the answer with a (pre-prepared?) barb, the PM says the Conservatives are "all wind and no turbine". I think the 50% tax for bank bonuses is a great idea. Banks should learn that we are all struggling and being bailed out by the government isn't an excuse to give themselves big bonuses again. 1225 Labour's Lindsay Roy asks about the future of child tax credits. The PM says they have lifted 500,000 children out of poverty and he would regret very much any decision by a party to cut them - that party being the Tories. He says Mr Cameron wants to "hurt the many and help the few". 1220 Lib Dem leader Nick Clegg gets angry after his efforts to discuss the issue of child poverty are met with loud jeers from Labour backbenchers. "You can shout as much as you like," he says, "But it doesn't change the facts." Mr Brown comes back with a list of improvements he says the government has made, including Sure Start and child tax credits. 1219 A question comes about Tory parliamentary candidate Zac Goldsmith who has been found to have non-domicile tax status. The PM says this proves the Conservatives favour the rich and are the only party in history "to have come up with a tax policy just for themselves". 1217 Mr Cameron asks whether the PM will support a 5% cut in ministerial pay and a 10% cut in the size of the Commons. The PM ignores those suggestions and attacks the Tories' economic policy instead. He says the Tory leader has "lost the art of communication, but not the power of speech". positivematt tweets: This Tory is cringing. What's happened to Dynamo Dave? He's making Gordon look a) like a leader and b) like he has a grip. 1215 Mr Cameron changes tack to MPs' expenses. Giving full details of second home allowances is "a vital part of rebuilding trust in this place". He says he wants more thorough breakdowns of claims to be published. Mr Brown insists he has nothing to hide, but Mr Cameron comes back again, saying the issue is "profound". He is met with barracking from Labour backbenchers, who are then told to "simmer down" by the Speaker. Though the tax rises on the well-off will grab the headlines, we should remember that when public services are inevitably cut, it is the less well-off who will suffer. 1210 Mr Cameron says British forces are still spread too thinly in Helmand province, leaving them vulnerable in comparison to the Americans. In reply, the PM insists troops levels are being "thickened" and bolstered by Afghan personnel. 1207 Tory leader David Cameron also pays tribute to the 100th British casualty in Afghanistan. He says troops don't want sympathy and pity, they want support back home. He says we now have the last, best chance to end the campaign in the country successfully. 1203 To the Commons, and Mr Brown begins his Q&A session by paying tribute to the latest British casualty in Afghanistan - the 100th death this year. 1201 As PMQs is about to start, MP Michael Fallon restates the Tory message once again that efforts to cut the deficit must start now. Bashing the bankers will not make a huge amount of money, he says, adding that public sector finances are where real change is needed. 1200 Former home secretary Jacqui Smith introduces one of the words of the day - "fair". "Fair taxes", "fair cuts", all designed to contrast the government's plans with those of the Tories, which it, of course, feels are "unfair". She says Labour will make sure that "those will the broadest shoulders" bear the brunt. I am an unemployed IT Manager. I am 48 and I have been trying to get a job since March. I would like to see a pre-Budget report aimed at getting me back in to work. I can't see anything aimed to do that. We have the government cutting the NHS IT scheme, banks doing nothing, public services looking to get cut. What can he do for me? Nothing. 1155 The BBC's Nick Robinson says there will have to be "eye-watering" cuts to government departmental budgets in the coming years. We're unlikely to hear much about the most painful ones though today, he says. Can someone elaborate on the deficit and debt thing? Halving the deficit means halving the difference between income and expenditure - yes? The debt can remain the same whilst this is happening? And that is a good thing? 1148 The BBC's Naga Munchetty is at CMC Markets in the City. Analyst James Hughes says people like him will focus on the chancellor's GDP projections and "just how wrong he was" with earlier forecasts. He also says there could be a brain drain from the financial sector if the bonuses are hit hard. 1144 He's out. The chancellor appears, clutching his pre-Budget report. There's a confident half-smile on his face, but is he as relaxed as he looks? 1141 Gordon Brown has just left Downing Street bound for the Commons. Mr Darling, meanwhile, remains inside the Treasury - is he dotting some final Is and crossing some Ts? 1138 BBC political editor Nick Robinson tells BBC Two's Daily Politics that he thinks a further rise in National Insurance is inevitable. Meanwhile, economics editor Stephanie Flanders says Mr Darling has to prove to the markets that he really is serious about getting the deficit down. She also says that the City won't like a speech that focuses more on higher taxes than spending cuts, because the former have a much shorter term impact on the economy. 1135 Scrapped your car already? Well, the BBC's John Pienaar says you'll soon be able to trade in your old boiler as well under a new scheme to be announced by Mr Darling. Also set for the scrap heap, our correspondent says, is the planned 1p rise in corporation tax - dreaded by nearly a million small businesses in the UK. 1133 We're also expecting announcements about cuts in government spending - balanced by much talk of protecting frontline health and education services. Going hand-in-hand with that will be tax rises - VAT back up to 17.5% and possibly even higher in the longer-term, and a potential hike in National Insurance. 1130 Looking a bit further ahead to the PBR itself, what do we know already? Well, top of the list will be more detail about a planned "supertax" on bankers' bonuses, something the government hopes will win it some brownie points with the public. The BBC's Robert Peston thinks any bonuses over £10,000 could be in line for a 50% levy. 1129 Tributes will also be paid to the 100th British soldier to die in Afghanistan this year. And mention may be made of "Eton-gate" - the row over who in the Commons had the poshest education and whether or not it matters. 1124 Coming as it does just before Mr Darling's big speech, we can safely expect PMQs to be dominated by talk of the economy. Gordon Brown will no doubt throw his support behind his chancellor, while the Tories are likely to say that whatever is planned will be too little too. 1122 Hello and welcome to our live coverage of prime minister's questions and more importantly, Chancellor Alistair Darling's pre-Budget report. My colleague, BBC deputy political editor James Landale, will be providing analysis throughout. And from BBC Two's Daily Politics, former home secretary Jacqui Smith, former Lib Dem leader Charles Kennedy and Michael Fallon, Tory deputy chairman of the Treasury Select Committee, will be adding their two-pence-worth. How will the government's plans affect you? How will the PBR affect your finances?